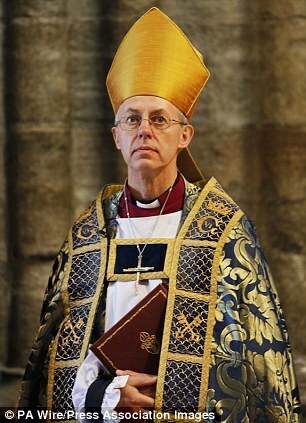 Wearing the Crucifix is now a fashion statement with no religious meaning, according to the Archbishop of Canterbury. The Most Rev Justin Welby said the Cross has been trivialised and ceases to shock or challenge people. Archbishop Welby wrote that the symbol should represent the 'deepest encounter and radical change' for Christians. He added: 'For those early Christians it was a badge of shame. 'Today it is more commonly seen as a symbol of beauty to hang around your neck. In a foreword to a book which will be published in the run-up to Lent next year, Archbishop Welby continued: 'Are we now living with a symbol emptied of power by time and fashion? 'Christianity with a powerless cross is Christianity without a throne for Christ or an aspiration for Christians. Archbishop Welby wrote in his foreword that the fact that the early church stuck to the story of the crucifixion - despite attacks on it - proves that it is true. He added: 'For God to be fully human, and then to die an ignominious death reserved for a criminal, seems so extraordinary and pointless as to be inexplicable. They look at theological or devotional Christian themes relevant to Lent, in preparation for the celebration of the Passion and Resurrection of Jesus Christ in Holy Week and Easter. The book, Looking Through The Cross, was written by Dr Graham Tomlin, the Dean of St Mellitus, a theological college in London. It will be published just before Lent next year, which begins on March 5. Dr Tomlin said of his book: 'First, it looks at the Cross, trying to make sense of this strange idea, that God the Father allowed his son to die a gruesome and painful death. 'The rest of the book is an exercise, not so much of looking at, but looking through. Crucifixion was used by the Romans to execute robbers and other common criminals. Constantine, the first Christian Emperor, abolished the practice in the Roman Empire in the 4th century AD. The Cross became the symbol of Christianity early in the history of the Church, but it had also been used also as a symbol by other religions and cultures. Despite Archbishop Welby's concerns, the Crucifix remains a powerful symbol for many Christians. After a legal battle, the European Court of Human Rights issued a landmark ruling earlier this year saying that Christians may wear a cross at work.